Bible Land Tour led by Ferrell Jenkins - March 31 -April 12, 2008. If you've been waiting for a great tour to the Bible Lands, with experienced leadership, you don't have to wait any longer. We have conducted more than 35 tours to the Bible Lands, but we'll try to make it the best ever for you. Our previous tours since 1967 have taken us to almost every area of Bible activity. Altogether this will be our 71st foreign tour. This travel experience and acquaintance with Bible lands will do much to make this trip the "trip of a lifetime" for you. The tour is planned to my specifications. We have our own guides and coaches and the tour is under my personal direction throughout. We plan to visit Israel and Jordan where so many of the exciting Biblical events took place. Tel Aviv and Joppa. Modern Tel Aviv is built on the ancient plain of Sharon along the beautiful Mediterranean. Joppa is where Jonah set sail for Tarshish. Peter raised Dorcas and received instructions to preach to the Gentiles. Caesarea. First century Roman capital and seaport where the gospel was first preached to the Gentiles and where Paul was imprisoned for two years. Haifa and Mt. Carmel. Ascend beautiful Mt. Carmel for a magnificent view of the city and harbor. Visit site associated with Elijah and the prophets of Baal. Megiddo. The valley of Jezreel (the Armageddon of Rev. 16:16). Visit museum, ruins of city, the stables, and ancient water tunnel. Beautiful view of the Jezreel valley. Nazareth. Boyhood home of Jesus. A visit to the Nazareth Village is included. Cana of Galilee. Traditional site of Jesus' first miracle. Sea of Galilee Area. Because there is so much to see we will be spending two full days in this area. All points of interest around the Sea of Galilee including sites for feeding of 5,000, the Sermon on the Mount, Capernaum, Bethsaida, Chorazin, and Magdala. Enjoy a boat ride on the sea. See the Jordan River, Hazor, Dan, and Banias (ancient Caesarea Philippi), Tiberias, Golan Heights. source of the Jordan River. This is the site of Caesarea Philippi. Valley of Jezreel. 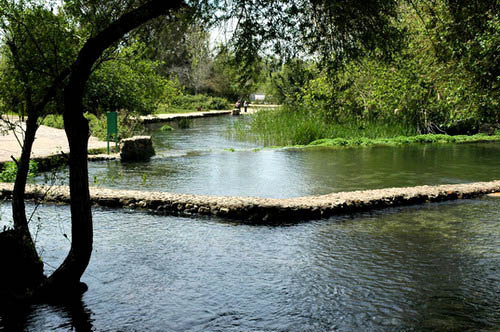 See the Spring of Harod, where Gideon chose his men, Mt. Gilboa, Hill of Moreh, and Mt. Tabor. See Jezreel, where king Ahab built a palace. Bethshean, where the Philistines hung the body of King Saul on the wall. Bethlehem. See the Church of Nativity and Shepherd's fields. Judea. Visit the Mount of Olives, Bethany, Wilderness of Judea, Jericho and Qumran where the Dead Sea Scrolls were found. See the Dead Sea, Ein Gedi and Masada. Jerusalem. Visits include the Garden Tomb at Gordon's Calvary  the Place of the Skull, Garden of Gethsemane, Valley of Jehoshaphat, Kidron Valley, Mount Zion, the Palace of Caiaphas, Pool of Siloam and Hezekiah's tunnel. Walk through the Old City. Visit Gihon Spring and the Pool of Siloam. Visit the Temple area, Mount Moriah, Wailing Wall, Pilate's Judgment Hall, Via Dolorosa and Church of the Holy Sepulchre. A walk through the market area of the city is an unbelievable experience. See the model of Jerusalem from the time of Christ (now relocated on the grounds of the Israel Museum), the Shrine of the Book and the Dead Sea Scrolls. The new archaeological discoveries in the Old City help to make many Bible events come to life. 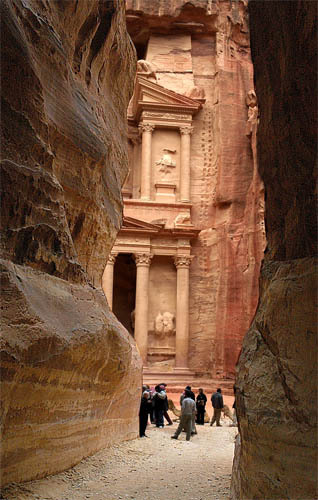 The first view of Treasury at Petra from the Siq is an exciting and memorable event. Petra is identified by many scholars as the site of the ancient capital of Edom called Sela. Read the prophecies of Jeremiah 49:16-17 and Obadiah. Petra became the capital of the Nabatean Arabs by about 100 B.C. The gifted people carved temples, theatres, tombs, and houses out of the beautiful sandstone. The pleasant horseback ride and the beautiful color of Petra will make this a day you will long remember. Jordan. Our three days in Jordan will allow us to visit the Jordan River at Bethany Beyond the Jordan, Heshbon, Madaba, Mount Nebo, Petra, Kerak, the Dead Sea, Deir Alla (possibly Succoth), Jerash, the Jabbok River, and Amman (biblical Rabbah). You will return home with an unforgettable experience lingering in your thoughts as you recall walking in the footsteps of the patriarchs, prophets, Jesus, the Apostles, and early Christians. Your Bible reading will have more meaning and your "world" will be a great deal larger. Our Bible Lands Tour of Israel and Jordan includes air transportation from John F. Kennedy Airport in New York on Lufthansa, superior first class hotels, buffet breakfast and dinner daily, private motor coach, comprehensive sightseeing with English speaking guides, admissions, porterage, etc. We are able to offer this excellent tour for $3295.00 per person  based on double occupancy and 20 or more tour members. Single supplement for an individual desiring a single room is $600 (based on availability). Airport taxes, U.S. departure tax, Israel departure fee, the Jordan visa fee, and any other hidden charge amounts to almost $400. We will collect $110 from each tour member for tips. The Israeli visa which we get on arrival is free. A deposit of $350.00 will reserve a place for you. This is really a high quality tour. Early reservation is a must! The final payment is due December 31, 2007. Is This a Good Time to Visit the Bible Lands? In early April the country should be green and dotted with beautiful flowers. We are able to take advantage of some extremely good air fares at this time. Even if you have been before, this is a great time to see the changes that have taken place since your last visit. The detailed brochure will be ready in a few weeks. We are now ready to receive deposit reservations from those who wish to join us for the trip. We anticipate that the tour will be filled before the brochure is ready for distribution and we urge you not to wait if you want to join this tour. The complete brochure will include cancellation policies. At this point I must state that there will be an administrative cancellation fee of $50 per person for any person cancelling at any time after making a deposit. Other graduated cancellation requirements begin 95 days prior to the departure date. The Email address is a graphic to prevent robots from capturing the address. You must type the Email address. Visit our Biblical Studies Info Page. Visit our Travel Blog about the Ancient Crossroads tour of Turkey in 2007. Go back to May to begin tour. Visit our BibleWorld page. Here you will find a list of National Geographic articles on the Bible Lands. as a seller of travel. Registration No. 10133.